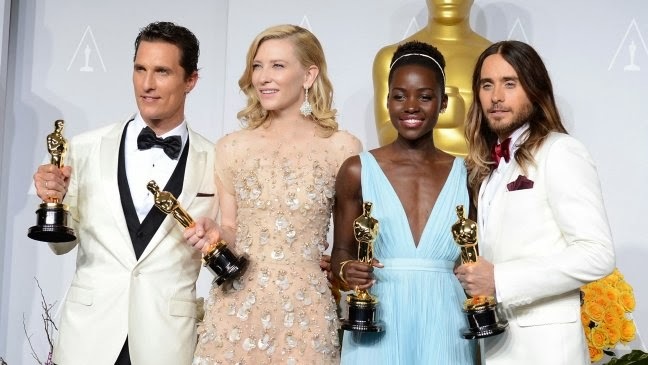 The 86th Annual Academy Awards was held at the Dolby Theater in Hollywood on March 2, 2014 (Sunday evening in America). Best Actor: Matthew McConaughey, "Dallas Buyer's Club"
Note: This is Matthew McConaughey's first Oscar nomination and win. Note: This is Cate Blanchett's first Oscar as Best Actress. She was nominated six times already, and won her first Oscar for her supporting role in The Aviator in 2005. 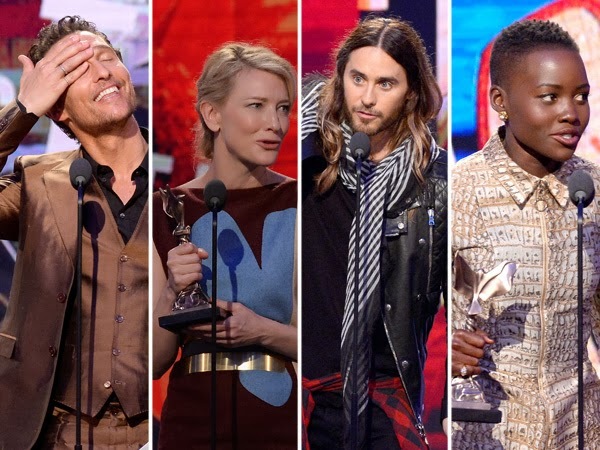 Best Supporting Actor: Jared Leto, "Dallas Buyer's Club"
Note: This is Jared Leto's first Oscar nomination and win. Best Supporting Actress: Lupita Nyong’o, "12 Years a Slave"
Note: This is Lupita Nyong'o's first Academy Award nomination and win. Best Director: Alfonso Cuarón, "Gravity"
Note: Alfonso Cuarón has been nominated six times in total. Best Original Screenplay: Spike Jonze, "Her"
Note: This is Spike Jonze's first Oscar win and fourth nomination. Best Adapted Screenplay: John Ridley, "12 Years a Slave"
Note: This is John Ridley's first Academy Award. Best Original Score: Steven Price, "Gravity"
Best Production Design: Catherine Martin & Beverley Dunn, "The Great Gatsby"
Best Film Editing: Alfonso Cuarón & Mark Sanger, "Gravity"
Best Cinematography: Emmanuel Lubezki, "Gravity"
Note: Emmanuel Lubezki's nickname is 'Chivo' (the goat). Best Sound Editing: Glen Freemantle, "Gravity"
Best Sound Mixing: Skip Lievsay, Niv Adiri, Christopher Benstead & Chris Munro, "Gravity"
Best Foreign Language Film: "The Great Beauty"
Best Documentary Feature: "20 Feet From Stardom"
Best Documentary Short Subject: "The Lady in Number 6: Music Saved My Life"
Best Live Action Short Film: "Helium"
Best Visual Effects: Tim Webber, Chris Lawrence, Dave Shirk, Neil Corbould, "Gravity"
Best Animated Short Film: "Mr. Hublot"
Best Makeup And Hairstyling: "Dallas Buyers Club"
Best Costume Design: Catherine Martin, "The Great Gatsby"